Sweat. It’s something that heralds embarrassment for most people, except in sweaty “safe zones” like the gym or sauna. Yet it’s a critical part of our anatomy, and there’s so much more to sweat than merely an indicator of how many burpees you did at the gym. In fact, sweat is a treasure trove of information when it comes to our health and state of wellbeing. Scientifically, the complex balance of electrolytes and metabolites contained within our sweat can be directly measured to get a surprisingly accurate picture of the processes taking place within our bodies. Sweat samples can tell doctors whether we’re suffering from an illness, whether we have a chronic infection, and even whether we’re in a state of constant stress or trauma. For the most part, the amount of sweat we expel throughout the course of any given day varies based on the activities we partake in. And when our bodies are functioning as they should, the volume of sweat expelled reflects our state of health. But then there are times when you’re still pumping the stuff out and you’re not even really doing anything. If you find yourself sweating around the clock for no particular reason, you may have a condition called hyperhidrosis. Essentially, this is a condition that describes someone who sweats when they really shouldn’t be, and it suggests that you may need to schedule a visit to the doc to determine why your sweat glands are out of whack. 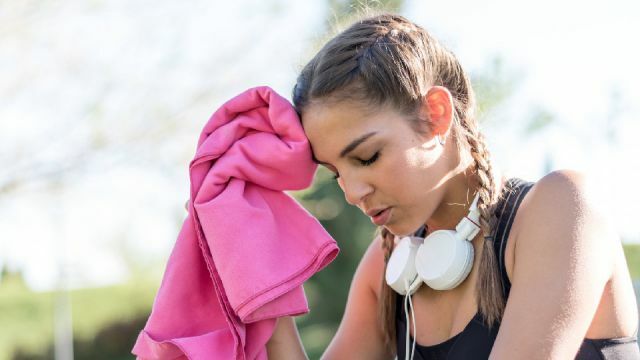 While sweating too much when you’re not exercising is a cause for concern, if you’ve always found yourself sweating a lot more than the next person while you are exercising, there’s no cause for concern. Generally speaking, in fact, the more you sweat during exercise, the fitter you are. A Japanese study published in the Journal of Experimental Physiology found that people who have greater levels of fitness tend to sweat both more and sooner than people who are less fit. So if you find yourself with a big ol’ sweat patch on your t-shirt only five minutes into a workout, be happy in the knowledge that you’re doing something right. Nobody wants to be that guy or gal who has everyone around them wrinkling their nose. And if your sweat is super stinky, no amount of deodorant will cover up that pervasive odor. Chances are, your sweat stinks because you’re stressed out. Our sweat smells markedly different depending on our state of mind, and as a rule of thumb the sweat you produce while doing a stress-free workout or any form of exertion (ahem!) tends to be a lot less smelly than the sweat you make while in a tense meeting or during a presentation. This is due to the fact that your body has multiple types of sweat glands that produce different types of sweat. It’s the eccrine glands that are responsible for secreting sweat as a form of cooling, and that sweat is generally just composed of salt and water. When you stress, however, your apocrine glands kick into overdrive, producing sweat that’s mostly located in your armpits and which is composed of a heady mix of protein, fat and bacteria… all of which makes for one potent aroma. While it’s fair to say that too much sweat can mean underlying health problems, the same can be said for too little sweat. If you’re working out, exercising or generally just exerting yourself and notice that you’re not really pumping much sweat out, there could be something wrong. If this is you, it could be due to a condition called anhidrosis — essentially the exact opposite of the excess sweat-inducing hyperhidrosis. Anhidrosis can be caused by a range of factors, but it’s most commonly due to either genetic predisposition or certain forms of skin trauma that directly impact the sweat glands. Either way, an inability to sweat means your body will struggle to regulate internal temperatures, which can be dangerous at the best of times. If you’ve noticed that you sweat just a little too much for comfort on your morning commute or during the first meeting of the day, it could be due to some heavy handed coffee drinking. The high levels of caffeine in coffee stimulate the central nervous system, which in turn switches on your sweat glands and encourages them to switch into sweaty overdrive. In addition, the heat from the drink itself can raise your internal temps, further increasing the rate at which you sweat. If this sounds like you and you’re sick of arriving to work saturated, maybe lay off on the coffee and caffeinated tea. Hey Buddy!, I found this information for you: "5 Things Your Sweat Says About Your Health". Here is the website link: https://www.thealternativedaily.com/5-things-your-sweat-says-about-your-health/. Thank you.